Summer is fast approaching and there is no better way to celebrate it than to capture all those remarkable moments! 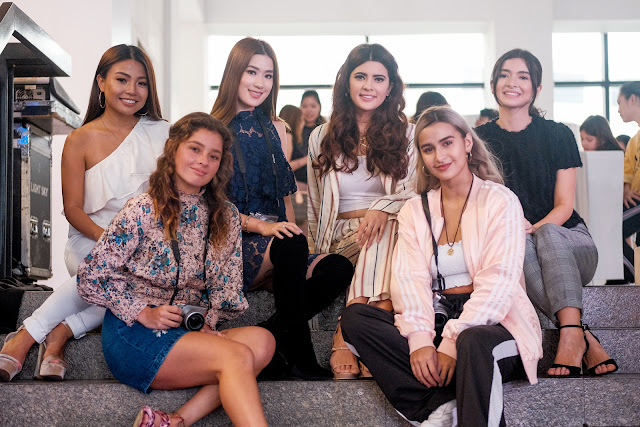 With the launch of the NEW Fujifilm X-A5, seven new brand ambassadors made sure you’re summer-ready -- Shy Carlos, Issa Pressman, Michelle Dy, Janeena Chan, Bea Benedicto, Chelsea Robato, Katarina Rodriguez and Andi Eigenmann. Capture your fun adventures with the Fujifilm X-A5, the smallest and lightest mirrorless digital camera from the X Series range. Combining a new 24.2 megapixel sensor with the X Series signature color reproduction technology, the X-A5 levels up with a newly developed zoom lens, 4K movie recording, touch screen, and the latest Bluetooth pairing technology, perfect for all your social media updates! Is vlogging part of your summer checklist? Just like beauty vlogger Michelle Dy and fitness enthusiast Bea Benedicto, you can document your passions by using the X-A5’s High-speed HD Video function. There is also a 2.5mm microphone jack, for better sound recording. The X-A5 allows you to record your favorite activities in HD video up to quad speed for slow motion slips. You can also have different bokeh-similar effects with its Multi Focus Mode. It automatically stacks 4K quality images while cleverly changing the depth of field required. Now you won’t miss a snap with X-A5’s 4K Burst function -- shooting 15 frames per second in 4K image quality. Summer sunshine makes anyone feel bright and vibrant. Capture your good side by having perfect selfies and groufies with the X-A5’s touch screen 180-degree tilting rear LCD Screen. The 180-degree rotation also activates the Eye AF function. This helps our beauty mavens, blogger and host Janeena Chan and Miss Intercontinental 2017 First Runner-up Katarina Rodriguez take high-quality self-portraits by focusing on their eyes. It also has the three-level Portrait Enhancer Mode, which improves skin tone. It really is the perfect gadget to level-up those summer selfies! For our resident island girls, actress Andi Eigenmann and model Chelsea Robato, harsh sunlight is no longer a problem. Take in summer’s vivid lighting with X-A5’s increased range of ISO Sensitivity extended to ISO 128000, and feel free to be artistic with its Film Simulation Modes. Aside from its standard 11 film simulation modes, the X-A5 also has 2 new advanced features -- Fog Remove and HDR Art. The new intuitive touch-panel GUI LCD facilitates a live view of film simulations, which allows you to choose the filter you want to use. For singer Issa Presmann and actress Shy Carlos, summer in the city wont be boring at all as you can still capture those sun-kissed skylines with the Fujifilm X-A5! With its newly developed 24.2 megapixel APS-C sensor partnered with Fujinon lenses, the X-A5 levels up your run-of-the-mill photos with better image resolution, thus ensuring finer details of photo’s texture, form, and even the atmosphere of your chosen landscape. It outperforms previous models in terms of SR+AUTO mode, color reproduction performance and “skin tone” reproduction capability. The new Fujifilm X-A5 comes in three colors -- pink, brown, and silver. This compact camera comes with a new kit lens, XC15-45mmF3.5-5.6 OIS PZ, currently the smallest and lightest zoom lens. It is the first electric power zoom in the Fujinon Lens Family and has a minimum shooting distance of 5cm from the lens surface for macro. Apart from the new ambassadors, present during the Fujifilm X-A5 launch are photography enthusiasts Ramon Bautista, Roxanne Barcelo, Victor Basa, Jay Contreras, Sarah Abad, Kim Cruz, Kerwin King, Deegee Razon, Shaira Luna, Reese Lansangan, Erika Rabara, and Lharby Policarpio. Join this summer’s stylish set of ambassadors by getting yourself the hottest accessory this season, the Fujifilm X-A5! ※1 X-Trans is a trademark or registered trademark of FUJIFILM Corporation.